One day my stepson Jerry dropped by to talk to his dad, mentioning that he wanted to join the Army National Guard to “do something bigger” than himself. He was slightly past the enlistment age, so he would have to get permission from the Army. His dad, having been in the Air Force, told him to do what he felt was right. All of us knew that there was a war going on. We were about to embark on the journey of military families. The Army National gave permission for him to enlist – they needed people with his computer skills. He was off and running. Lots of running. From Basic training to Officer Candidate school, Jerry worked his way up to 1st Lieutenant. We traveled to both his graduation from Basic and OCS at Fort Sill, Oklahoma. 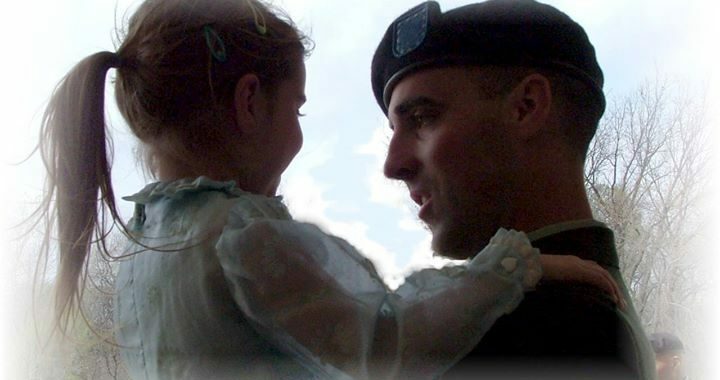 His daughter Maddie desperately missed him for all those long weeks, but she toughed it out. In 2010, his unit was called up for deployment to Iraq for Operation New Dawn… and the worries cranked up to high. He would be gone for 12 months. TWELVE. His wife Mindy is a “military brat” so she didn’t freak out… she was an absolute rock. At least it seemed that way. She did worry like the rest of us, it just didn’t show too much. The rest of us only semi-panicked. The Army did an “orientation” to tell us what we could talk about and what we couldn’t to keep the team safe. Watching him leave on the bus with the rest of them caused a huge lump in our throats. It could easily have been the last time we’d see him alive. 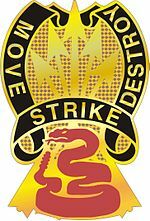 His deployment was with the 145th Brigade Support Battalion, part of “Task Force Snake” – which was part of the larger 116th Cavalry Brigade Combat Team (AKA the Snake River Brigade). We SKYPED, we wrote, and we sent care packages. We tried to keep the letters light. Some of the care packages thing was more for our benefit than his – it kept our brains engaged so our emotions wouldn’t mess up. We just wanted to do SOMETHING to help. He had plenty of stuff. Including sand. Lots of sand. He was in a “relatively safe” area (so they said), the infamous “green zone” and inside most of the time. But one member of the 145th was severely injured from an IED while on patrol outside that zone. We consoled ourselves with the thought that Jerry was inside out of harm’s way. Except for the IEDs. And mortars. And snipers. And attacks. We prayed a lot. He returned home none the worse for wear in September of 2011 (with a little heightened awareness issue, but that’s pretty normal from waiting for attacks 24/7). We planned a big get-together with numerous inch thick steaks for the whole family. Of course, I ended up in the hospital with a brain bleed that day, so they got all the meat and I missed the welcome home party. 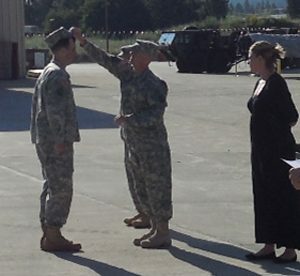 Some time after he returned, he was pinned as a Captain. He’s out now, back in the civilian world. But he’s still a veteran. And we will always be proud of his service and his life, as we are for both the ‘kids’ and their families. Yeah I know, they haven’t been “kids” for a long time. For our veterans, family is their most important support group. We were fortunate that nothing happened to Jerry during his deployment. Others are not as lucky- death can happen at any time, wherever in the world they might be. Horrific injuries, PTSD, difficulties happen…and no matter what, it’s our job to support them before, during, and after their time of service. Families of military members also sacrifice when their loved ones are away. We had it easy, as much energy that was expended on concerns. Whether it’s a Blue Star family with a service member deployed, or a Gold Star family that has lost a loved one, today on Veteran’s Day let’s remember them too. You can read about Marine Ross Schellhaas’ family, written by his wife, Kristine Schellhaas. It’s entitled 15 Years of War, about how the long war in Afghanistan affected the family. It’s worth reading! Get tissues, however. Note: Kristine is the original founder of USMCLife news.